Ministry of Youth Affairs & Sports to Initiate “Adopt A Slum” Campaign in Delhi.“I Have Adopted Timarpur’s Indira Basti Under This Campaign”: Vijay Goel. Slum Yuva Daud/Marathon to Mark Start of Campaign on May 26. 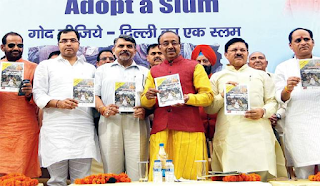 New Delhi: Minister of (Independent Charge), Youth Affairs & Sports, Shri Vijay Goel today announced “Adopt a Slum” - a new campaign to mark completion of three years of the Government. Addressing a press conference here today, the Minister said that the idea is to initiate developmental work in these slums and help the slum-dwellers in resolving various issues. A slum Yuva Daud/Marathon will mark the beginning of this campaign on May 26. The Minister also said that the Government under the leadership of the Prime Minister, Shri Narendra Modi, is committed to the cause of the weaker sections. He added that the fire that illuminates lives in a positive way and resolves social and economic issues, must be kept burning. Shri Goel further said that Ministry of Youth Affairs & Sports, along with Nehru Yuva Kendra Sangathan, under the aegis of the Ministry, will initiate “Adopt a Slum” campaign and groups like NSS, public schools, rotary clubs, will pool in with efforts and manpower. Shri Goel also stated that he has adopted Indira slum of Timarpur area under the campaign. A booklet, highlighting the key issues that will be addressed with this campaign and how the entire process will be initiated and executed, was also released on the occasion. The NYKS will adopt slums across 11 districts and will work for their overall development with young volunteers. The “Slum Yuva Daud” will be organized on May 26 at 6 am at Shankarlal Hall in Delhi University. Similar marathons will also be organized at Wazirpur, Model Town, Adarsh Nagar, Chandni Chowk, Burari and many more areas.